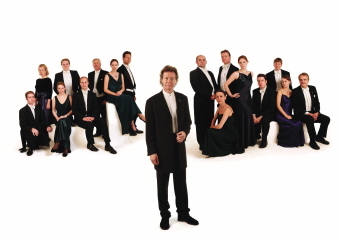 The world famous choral ensemble with their internationally acclaimed conductor, Harry Christophers - are coming to St James the Greater as part of their 2008 Choral Pilgrimage. 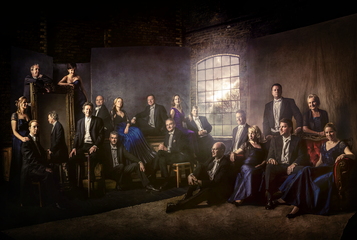 The Tallis Scholars, who have established themselves as leading exponents of Renaissance sacred music through world-class recordings and concert performances, are coming to St James the Greater with a concert entitled "Journey through Advent to Christmas". The world famous choral ensemble with their internationally acclaimed conductor, Harry Christophers - are making a return visit to St James the Greater as part of their 2009 Choral Pilgrimage, this time with a 22 piece Orchestra - to perform Handel's Coronation Anthems. 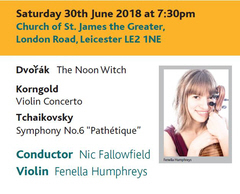 Ticket price has been kept as low as possible, while remaining consistent with the cost of bringing over forty high quality professional musicians to Leicester. You may wish to donate tickets as a gift to music-loving friends or relatives. 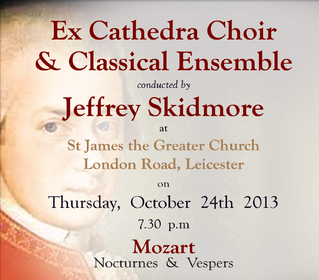 This performance celebrates the 400th anniversary of the composition of this thrilling work. This concert combines some of the composer's most thrilling music with an informative, moving, and at times humorous dialogue. Enfield, assuming the role of an aged Handel - a German, soon to become an Englishman, and a favourite of Kings - reminisces to the audience, taking them on his extraordinary journey. We learn of the composer's formative years in provincial Saxony, his departure to Hamburg, his travels in Italy, and his arrival in London, during the midst of a golden age. 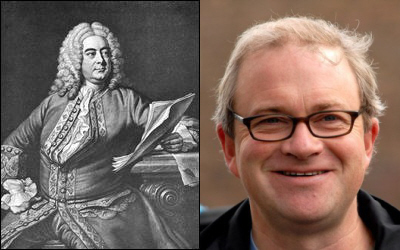 The Rinaldo Consort, the Leicester Bach Choir, soloists David Blackadder, Ruby Hughes, Christopher Lowry, Giles Underwood and an armada of baroque trumpeters conducted by Benedict Hoffnung combine to tell this dramatic story of the 18th century. A concert to celebrate the 400th anniversary of the most famous Spanish composer of the 16th century, Tomas Luis de Victoria. During the weekend when the nation holds acts of Remembrance for those who gave their lives in the service of their country, we invite you to join us to reflect on and acknowledge the musical interpretations linked to aspects of remembrance and peace. 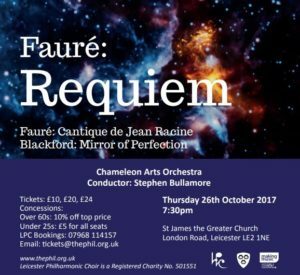 The programme includes the Fauré Requiem, Haydn's Little Organ Mass and Chilcott's The Face Of Peace, with pieces by Bruckner and Elgar. Christmas - a season of joyous celebrations with moods of quiet reflection for everyone. 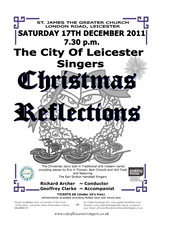 It is with this in mind that The City of Leicester Singers has chosen a compilation of carols both new and more traditional to reflect the changing moods of the festive season. The carols guide us through the story of the Christ Child's birth from the gentle "O little Town of Bethlehem" to the joyous finale of the world rejoicing in "O Come All ye faithful". Also featured in the concert will be "The Three Ships" by Eric H. Thiman, a recent composition by Will Todd "The Christ Child" and Paul Edwards' "No small Wonder". Musical interludes in the concert are provided by The Earl Shilton Handbell Ringers. 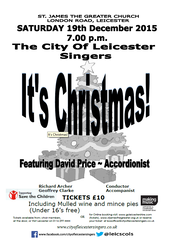 The City of Leicester Singers are supporting the charity CLASP this year, a charity set up in 1994 dedicated to improving the lives of carers and their families. The work provided by CLASP makes a huge difference to people struggling to cope with disabled or chronically ill loved ones. 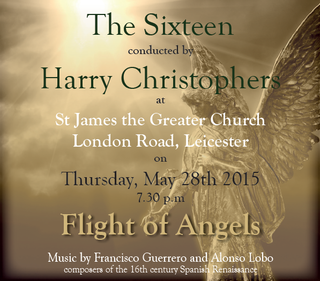 The Requiem by Bob Chilcott, (first performed in Oxford in March 2010), will form the first part of the programme. This is not music for mourning but a gentle and tender Requiem which is thoughtful and contemplative. It uses words from Missa Pro Defunctis and the Book of Common Prayer to give a new slant upon established texts. Handel's Messiah is often performed during Advent. 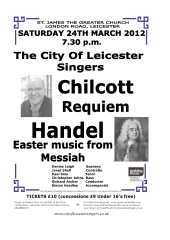 However, the oratorio contains much music which is appropriate to Passiontide, and under their conductor Richard Archer, The City of Leicester Singers will perform the Passiontide music from Messiah as the second part of their concert programme. 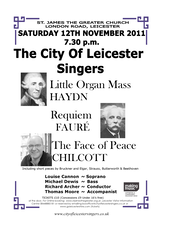 Chilcott's Requiem requires Soprano and Tenor soloists in addition to the four part Choir and COLS are pleased to have secured the services of Denise Leigh and Paul Smy in these roles. In the second part of the concert these soloists will be joined by Janet Shell, Contralto (appearing by arrangement with Chameleon Arts Management) and Christopher Johns, Bass, for the excerpts from Messiah. The organ accompaniment will be provided by Simon Headley, who is an Associate of the Royal College of Organists and Assistant Director of Music at Leicester Cathedral. Music by the three most celebrated composers of the Franco-Flemish Renaissance - Brumel, Lassus and Josquin. 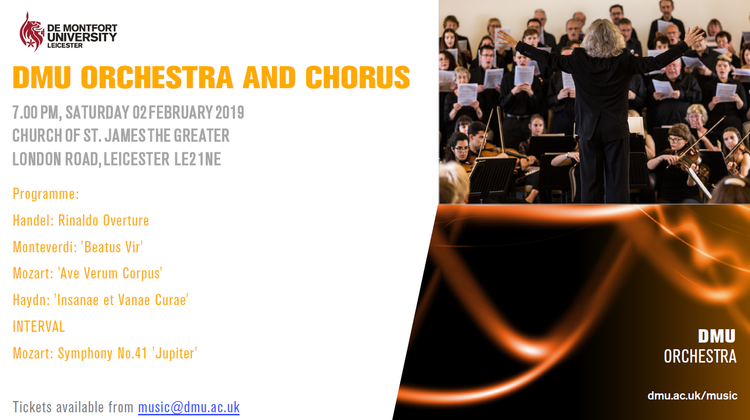 Unlike many such events which focus on a single major work, this Come and Sing will have as its theme Great Choruses from Great Oratorios, interspersed with solo contributions. The choruses have been chosen from the compilation made by Brian Kay and published by Novello, and provide a varied selection of the well known, as well as the less familiar. 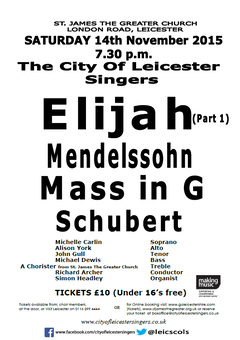 The Handel choruses: See the conqu'ring hero from Judas Maccabaeus and Hallelujah from Messiah will provide the opening and finale to the concert, while the first half of the programme will include Bach's peaceful Sleep well from St. John Passion; two beautiful and reflective choruses from Mozart's Requiem - Lacrimosa and Hostias ; and a Mendelssohn selection - He watching over Israel from Elijah. The first half will conclude with the final glorious chorus from the second symphony Hymn of Praise. The second half will begin with the first two choruses of Vivaldi's Gloria and the duet (Laudamus te) for two sopranos. Haydn will then be represented by two contrasting choruses Dona nobis pacem, the jubilant conclusion to the Harmoniemesse, and the delightful, lyrical opening chorus Come, gentle Spring from The Seasons. The final three choruses all look to the triumph of the resurrection: Beethoven's Hallelujah from his only oratorio Christ on the Mount of Olives; Fauré's beautiful In Paradisum from Requiem, once described as a lullaby of death and Handel's mighty Hallelujah Chorus. 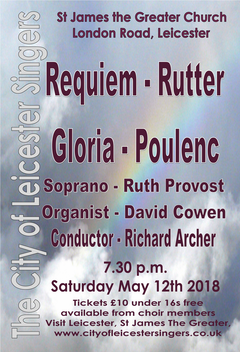 This uplifting concert will be directed by Richard Archer, accompanied on the organ by Geoffrey Clarke, and will include solo and duet contributions from members of The City of Leicester Singers. 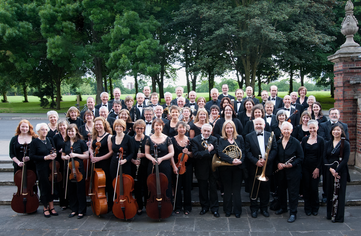 The Charnwood Orchestra has around fifty players, most of whom live in the Charnwood area. Since its founding, it has been a focal point for local musical talent, and today attracts players of all ages, who perform together with genuine enthusiasm and musicality. The orchestra was founded in 1973 by Joseph O'Reilly, Director of Music at Rawlins College in Quorn. Since that time it has enjoyed the direction of several conductors, each of whom has brought something new to the orchestra in style and taste. Currently under the direction of Nic Fallowfield, the orchestra is performing a very wide range of exciting and imaginative programmes and continues to grow in reputation. 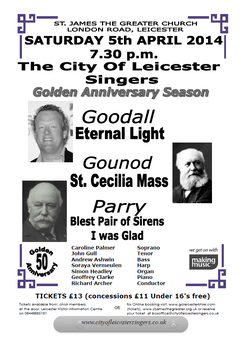 A feast of choral and organ music by one of Leicester's best kept choral secrets, the Leicester Church Music Consort as they celebrate their 40th anniversary, making one of their rare concert performances. The group of 30 singers drawn from all over Leicestershire has sung to great acclaim at Cathedrals and Abbeys all over England, including Westminster Abbey, St Paul's Cathedral and York Minster. 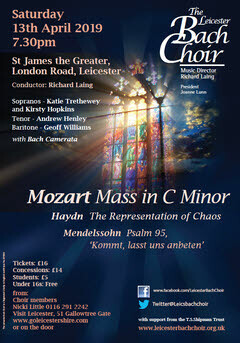 The concert will include anthems by Stanford, Howells, Wood, Mathias, Tallis, Batten and Haydn amongst others and will also feature organ solos by some of the LCMC's organists, Timothy Lees, Simon Headley, Ian Orr with the Consort being accompanied by Stephen Moore and directed by Paul Morley. WALTON - 2 pieces from "Henry V"
Hailed in his day by composers, contemporary music historians and aristocracy alike as one of the most significant musicians of the time, Adrian Willaert stood astride some of the most significant musical developments of the early 16th Century. Recognised as a the master of the prima practica - the school of polyphony later most associated with Palestrina - he was also in Venice at the birth of the multiple choir works we know best through Gabrieli and Monteverdi. How could one man be so influential in two such different styles of music? In this, Willaert's 450th anniversary, Kingfisher Chorale, joined by sackbut ensemble Piffari, chart the change in styles and musical fashions. Through his music and that of his contemporaries, including Ockeghem, Gombert, Mouton and Gabrieli, we follow him as he moves from his Flemish origins, through France and central Italy, and finally to Venice where he laid the musical foundation for extraordinary developments in the early 17th Century. The main work will be Rossini's Petite Messe Solennelle. Rossini said of it "Dear God... Have I truly written la musique Sacree (sacred music) or la sacree musique (damnable music)? ...Not much skill, a little heart, and that's about it". The work is neither small - it is nearly as long as Verdi's Requiem, nor solemn, ranging from hushed intensity to boisterous high spirits. La Petite Messe Solennelle is overtly operatic and musically eclectic in style. It is full of memorable tunes and rhythmic vitality, and will be performed in its original version scored for two pianos and organ. Our programme will also include the second movement of the Brahms's Ein deutsches Requiem, Denn alles Fleisch, es ist wie Gras, which centres on the heavy rhythms of the funeral march in proclaiming the inevitability of man's fate. Some old friends join us for this performance:- Janet Shell (Alto), and Thomas and Stephen Moore (pianists) and we will be joined by Elizabeth Roberts (Soprano), Andrew Phillips (Tenor) and Jamie W Hall (Bass). All vocal soloists appear by arrangement with Chameleon Arts Management. We will be accompanied on two pianos by two exceptional musicians - Thomas and Stephen Moore. Both are from Leicester and were at one time organists at the church of St James the Greater. Our organist will be Geoffrey Clarke, another fine musician from Leicester. This year The City of Leicester Singers have chosen the theme of nature for our Christmas Concert. This is reflected in carols including The Cherry Tree Carol, Jesus Christ the Apple Tree, A Spotless Rose, & Rise up Shepherds and Follow. 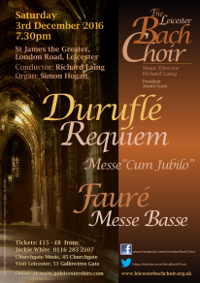 We have also included Jubilate! Jubilee! a new piece composed by Paul Mealor, written in honour of the Diamond Jubilee. The work is a setting of a specially written poem by the Rt. Revd Dr George Rowell, the Bishop of Gibraltar and is included to mark the end of the Diamond Jubilee Year. The audience is invited to join in several familiar carols including Good King Wenceslas, O Little Town of Bethlehem and Once in Royal David's City. Our conductor is Richard Archer and our Accompanist is Geoffrey Clarke. We are joined by the Ratby Junior Brass Band who will be playing a selection of favourite carols under the baton of Becky Moss. The Band was formed in 1973. It has an average membership of 65 players between the ages of 7 and 19 (plus a few adults). The programme included the world premiere of Jeremy Jackman's "Three Scribes"
The two main works will be contrasting versions of Stabat Mater. Literally translated as 'the mother stood', this thirteenth century hymn to Mary reflects on her sufferings during the crucifixion of Christ. 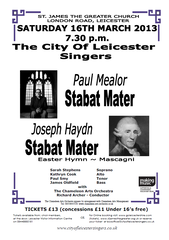 The choir will first perform a modern interpretation by Paul Mealor (b.1975), and secondly the Stabat Mater by Joseph Haydn (1732-1809). The third work, to celebrate Christ's resurrection, will be the Easter Hymn from the one act opera Cavalleria Rusticana (Rustic Chivalry) by Pietro Mascagni (1863-1945). 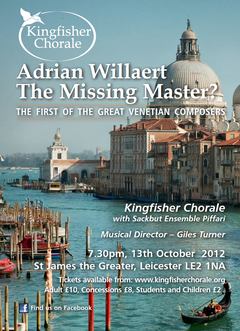 Soloists for this concert are Sarah Stephens (soprano), Kathryn Cook (mezzo), Paul Smy (tenor) and James Oldfield (bass). The Chameleon Arts Orchestra appears by arrangement with Chameleon Arts Management. Geoffrey Clarke will play the organ. 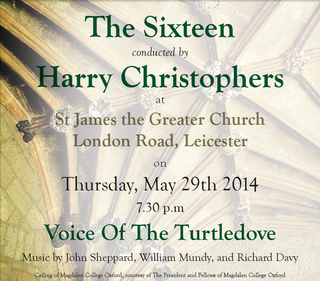 This will be the sixth visit to St James by this world famous choir. The Papacy refused to allow any copy of Miserere by Allegri to leave the Vatican, realising they were in possession of a work of considerable renown. There is a story that the young Mozart first broke this barrier of secrecy by copying the work out by memory having heard it just once. During the Choral Pilgrimage 2013 Harry Christophers and The Sixteen present a new version of Allegri's Miserere charting its evolution. They intend to shed light on the complicated history of this most famous of choral pieces. Harry Christophers says "I am very grateful for Ben Byram-Wigfield's amazing work on the Allegri. He has scrutinised all the available source material from the Vatican and other libraries, giving us an invaluable insight into the origins of the music. Sadly, nothing survives from Allegri's lifetime, and what we usually hear today is the result of scribal errors and fanciful interpretation. What we have attempted to do, by making use of the many sources, is to show how the piece has evolved over the centuries into the version audiences know and love today." Following our successful collaboration with the cellist Oliver Coates we are delighted to welcome Rowena Calvert to join us for another concert of music for cello and choir, this time with a Northern European flavour. A prize-winning graduate from the Royal College of Music, Rowena now pursues a busy career as a soloist and chamber music player, notably as a member of the Cavaleri Quartet. Rowena will be performing the popular concert piece Fratres by the Estonian composer Arvo Pärt and movements from J. S. Bach's sublime suites for solo cello. 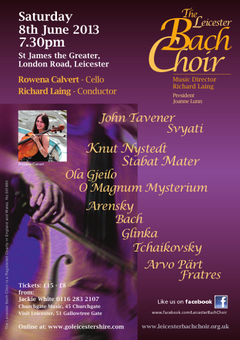 She also joins the Leicester Bach Choir in three modern classics for cello and choir by Tavener, Gjeilo and Nystedt. John Tavener is well-known for his beautiful carol The Lamb and for his Song for Athene, performed so memorably at the funeral of Princess Diana. Svyati is an equally serene and beautiful setting of a Russian Orthodox prayer. This mood is sustained in the piece aptly titled Serenity, a setting of the familiar text O magnum mysterium, expressing wonder at the birth of Christ, by the young composer Ola Gjeilo, born in Norway but now resident in the USA. The third of our joint performances is of the Stabat Mater by another Norwegian, the veteran Knut Nystedt, an exciting and dramatic portrayal of the mother of Jesus at her son's crucifixion, which nevertheless culminates in a radiant picture of Paradise. 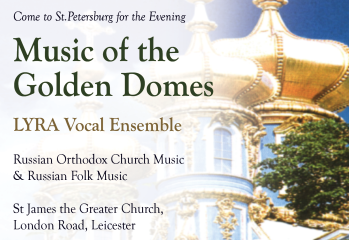 The programme is completed by three settings of the Orthodox liturgy from great Russian masters of the 19th Century: Tchaikovsky's Dostoino yest, a hymn to the Virgin Mary, Arensky's Otche nash, a setting of the Lord's Prayer, and the beautiful Hymn of the Cherubim by Glinka. The luscious Romantic harmonies of these are suited perfectly to the wonderful acoustic of St James the Greater. 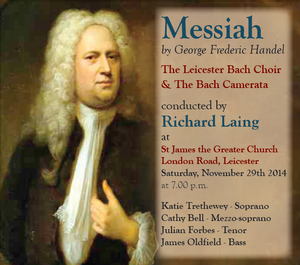 Richard Laing, Leicester Bach Choir's Music Director, is renowned for creative programming with strong thematic links and great variety. 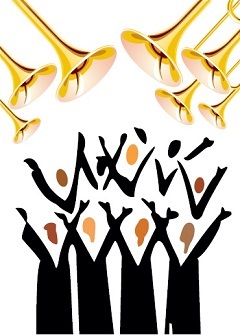 This summer concert will appeal to all lovers of choral music. Fussreise/A country walk; Verschwiegene Liebe/Silent Love; Lied eines Verliebten/Lover's Song; Der Tambour/The Drummer-boy (an amusing tale of an imaginary feast); Anacreon's Grab/Anacreon's Grave; Der Musikant/The Musician; Abschied/Farewell (a critic gets his come-uppance); Gebet/Prayer; Das Ständchen/Serenade; Der Rattenfänger/The Rat Catcher (Goethe and Wolf's version of the Pied Piper). After a brief break comes the Song Cycle Earth, Air and Rain by Gerald Finzi - settings of ten poems by Thomas Hardy, including the famous Rollicum Rorum and the lesser known, but highly dramatic and tragic The Phantom. The concert lasts just over an hour. Attendance is free. Please note the time of the concert. This symphonic poem paints a vivid picture of a caravan of Central Asians crossing the desert under the protection of Russian troops. You will hear the opening theme, representing the Russians, followed by the haunting strains of an intricate eastern melody on cor anglais, representing the Asians. The two melodies combine while the pizzicato strings are the plodding hoofs of horses and camels. The music dies away leaving only the Russian theme, so celebrating the silver anniversary of the reign of Alexandra II of Russia. A year after the Bolsheviks took power, Prokofiev received permission to travel to America, then Paris, where he lived and worked during the '20s and early '30s. The violin concerto was the last work he composed before homesickness overtook him and he made his final return to Russia. It was premiered in Madrid in 1935. It had been eighteen years since his first violin concerto, but the two works share a similar singing lyricism coupled with virtuoso passagework. The second, however, is more meditative at the beginning, more explosive at the end. There are echoes of both the romantic melodies and the brash peasant dance tunes from the composer's Romeo and Juliet, written around the same time. Sibelius had taken his wife and daughter to Italy for a holiday in the winter of 1900-01. While there he worked on sketches for the symphony. Italy was his second favourite country (naturally after Finland!) and many commentators have observed that the sunny and relaxed nature of the second symphony reflects the Italian influence. The symphony was seen by many as a nationalist work - an expression of Finland's struggle against Russian interference - in much the same way as "Finlandia" had been two years earlier. Sibelius, however, denied any nationalist intent - he saw it as being largely an abstract work. 2nd Wind was formed in 2007 by Sheehan's of Leicester in conjunction with the Music Industries Association. Its aim is to give lapsed adult players an opportunity to take up their instruments again, and to give adult learners a chance to play with others in a relaxed and friendly environment. From an enthusiastic group of approximately 16 diverse instrumentalists, the band has grown to sixty members whose abilities and experience range from those who have recently taken up an instrument to those who have played for many years. Our musical director is Brian Humpherson MBE, who is vastly experienced and is well known as a musical director and performer throughout Leicestershire and beyond. Brian is the driving force behind 2nd Wind and we are delighted to have him on board. New band members are always welcome. There are no auditions. All we ask is your commitment and enthusiasm. We rehearse on Wednesday evenings during term time at the Richard Attenborough Centre, University of Leicester Arts Centre, Lancaster Road, Leicester. 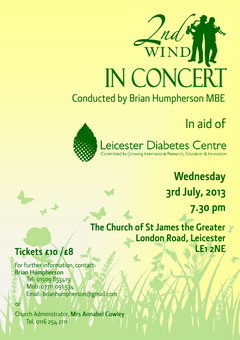 2nd Wind is performing in support of the world-renowned research taking place in the Leicester Diabetes Centre, Leicester General Hospital. Type 2 diabetes, in which the body cannot regulate the levels of glucose in the blood, is the Cinderella of the world of serious diseases. In the early stages, it's often symptomless, so that someone can have diabetes for many years before being diagnosed. Not surprisingly, few people realise that heart attacks, strokes, kidney failure, blindness and amputation, are the complications of uncontrolled diabetes. Diabetes is a leading cause of death and disability world-wide, and in Leicester City, Leicestershire and Rutland today, there are over 49,800 people with Type 2 diabetes, and at least a further 15,000 people who have the disease without realising it. New interventions developed and tested at the Leicester Diabetes Centre are supporting people who already have diabetes to get in control of their disease and avoid serious complications. Research is even allowing us to help those at risk of diabetes to avoid the disease altogether, or at least slow down its development. This is especially important in Leicester, where young people are worryingly starting to develop Type 2 diabetes at an early age. The work of the Centre relies almost totally on grants, sponsorship and donations, which is why we are delighted to be the chosen charity of Second Wind. For more information on diabetes and research visit our website. Part 2 starts with a tribute to the Verdi Bicentenary, featuring operatic choruses and arias, and continues with a vibrant kaleidoscope of folk songs from Ukraine's rich folk heritage. Complementing the awesome bass voices and adding a unique quality that distinguishes this choir, is soprano Valentina Ivanenko. She is joined by other outstanding soloists who feature in this not to be missed programme. For those who have not heard them before, the Boyan Ensemble is known for its purity of sound, delicately floated pianissimos and breathtakingly brilliant fortes. "Intense harmony, astonishingly low notes, utterly glorious singing - how did the basses attain a bottom B flat so effortlessly?" 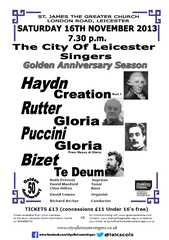 The 50th anniversary year of The City of Leicester Singers will commence with a concert comprising of a programme of pieces which the Choir has enjoyed performing in the past. We hope that the audience will enjoy hearing them again. The concert will start with Part One of The Creation by Joseph Haydn, which ends with the rousing chorus "The Heavens are telling". COLS last performed this in 2000, followed by The Gloria by John Rutter. This recalls a performance in 1984 when COLS combined with the BBC Radio Manchester Chorale to give one of the first performances of the work in the East Midlands. Concerts from 2009 and 2005 will be evoked through The Gloria from The Messa di Gloria by Giacomo Puccini and the Te Deum by Georges Bizet. One of Puccini's early works, The Gloria clearly demonstrates his potential as an operatic composer of fine tunes. Although not initially successful the Te Deum is now established as a popular and tuneful part of the choral repertoire. The Soloists will be Ruth Provost (Soprano), David Manford (Tenor) and Clive Hilton, one of COLS own members, (Bass). David Cowen will provide the organ accompaniment and our conductor will be Richard Archer. 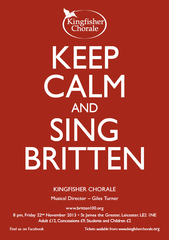 Britten is widely regarded as the greatest British composer since Purcell. Perhaps more than Purcell, the influence and admiration of his work spread far beyond these shores to Europe and in the opposite direction to America. His works for voices are undoubtedly at the heart of his output in every sense of the word. Featuring Rejoice in the Lamb, Hymn to St Cecilia, Choral Dances from Gloriana, Hymn to St Peter, and the magnificent Ballad of Little Musgrave and Lady Barnard. The Musical & Amicable Society are a small ensemble of strings and harsichord; they are all professional freelance performers and between them have appeared with most of the high-profile period instrument groups - including the English Concert, the Academy of Ancient Music, the Orchestra of the Age of Enlightenment, the New London Consort, the King's Consort, the Sixteen Orchestra, and the Amsterdam Baroque Orchestra. 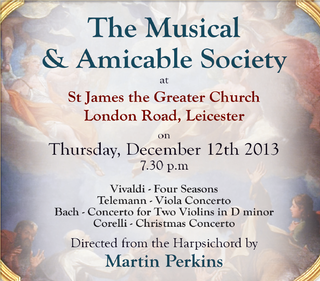 The programme includes Vivaldi's Four Seasons (with a different violin soloist for each season), Telemann's Viola Concerto, Bach's Concerto for Two Violins in D minor, and Corelli's Christmas Concerto. 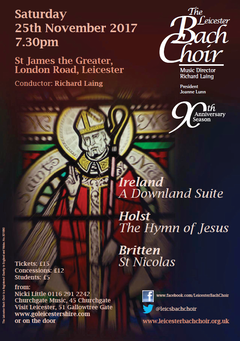 Leicestershire Chorale's final celebration of the Britten 100 year includes a rare Leicestershire performance of one his most challenging choral works. A Boy Was Born; a cantata for unaccompanied choir, soloists, and children's choir, was written whilst Britten was still a student at the Royal College of Music. Leicestershire Chorale are delighted to be joined for this, by the internationally-acclaimed Finchley Children's Music Group, who were themselves founded by Britten in 1958. The rest of the programme will include other short choral items of the composer and then a joint rendition of his Ceremony of Carols. This arrangement has been put together from both the original scoring for upper voices and the SATB version later arranged by Julius Harrison. A festive concert of carols and Christmas music for choir and audience. A traditional celebration of the Christmas season. 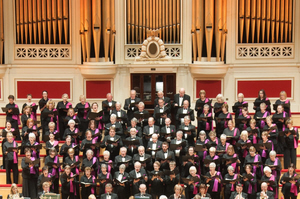 For many in Leicester, Christmas starts with the Phil's annual carol concert. 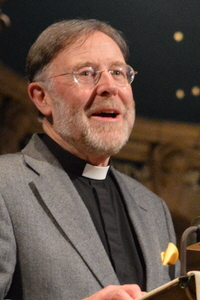 Michael Rule, Associate Director of Music at St James the Greater, will be at the organ and well-known broadcaster, John Florance, will be compère for the evening. Tickets £14 (from LPC Booking Manager, concessions available) to include a glass of wine and a mince pie. Advanced booking advised. Unreserved seating. 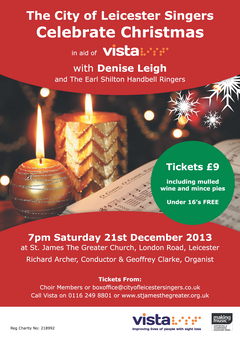 In this, our Golden Anniversary Season, The City of Leicester Singers are collaborating with Vista to perform a Christmas concert to celebrate the festive season. Our programme recalls the atmosphere of early Carol concerts performed by the Leicester and Leicestershire Teachers' Choir at De Monfort Hall. It includes familiar rousing carols for all to sing as well as joyful choir items, some with a touch of fun and a more secular approach. In this centenary year of Benjamin Britten's birth we will also sing two extracts from his "A Ceremony of Carols", Wolcum Yole and There is no Rose. We welcome back Denise Leigh as our soloist. Denise has performed before with The City of Leicester Singers, and sang at the Opening Ceremony of the Paralympic Games 2012. We are delighted that The Earl Shilton Handbell Ringers , who performed for us in 2011, will again be taking part in the concert. The conductor will be Richard Archer and the accompanist will be Geoffrey Clarke. Mince pies and mulled wine included in the ticket price. 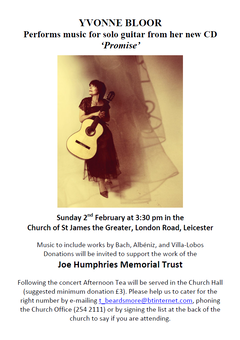 Following the concert Afternoon Tea will be served in the Church Hall (suggested minimum donation £3). Please help us to cater for the right number by contacting the Church Office or by signing the list at the back of the church to say if you are attending. The third concert in our Golden Anniversary season is a feast of well-loved choral music by composers covering the 19th, 20th and 21st centuries. The concert opens with the hymn most associated with the coronations of British monarchs, I was glad when they said unto me. This imposing, majestic music (originally written for the coronation of Edward VII) was composed in 1902 by Sir Hubert Parry. More recently it was used as a processional anthem at the wedding of the Duke and Duchess of Cambridge. It is a prayer for the peace of Jerusalem based on the words of Psalm 122. Our second work is by a living Composer - Howard Goodall. It must be a challenge for a modern composer to write a Requiem, given all the impressive names that have done so before with such a diversity of musical styles. Generally composers use the Catholic liturgical plan which emphasises judgement and hellfire. In this Requiem, Howard Goodall uses a gentler and thoughtful style in the hope of bringing comfort to those who grieve. The text of John McCrae's evocative poem "In Flanders fields the poppies blow" reflects the full horror of armed conflict in the Dies Irae movement, while in the Lachrymosa, the sad and beautiful words written by Mary E Frye "Do not stand at my grave and weep" are used. This Requiem was ready for release in 2008, the 90th Anniversary of the end of WW1. It is appropriate that we perform it in 2014 as we mark the centenary of the outbreak of the same war. The second half of our concert starts with another favourite by Parry - Blest pair of sirens - composed in 1887 as a setting of a poem by John Milton. The words concern man's desire to join the heavenly music of the Spheres. The work was dedicated to Charles Villiers Stanford and conducted by him at its first performance (by the Bach Choir) on 17th May 1887. This, incidentally, was another Golden Celebration - the Golden jubilee of Queen Victoria. Our final work is St Cecilia Mass composed by Charles Gounod in 1855. Gounod was fond of both sacred music and opera, and this is reflected in this stylish work which he composed for the Feast of St Cecilia, the patron saint of Music. It brings together a very French combination of operatic styles and the spirituality of Palestrina's music which Gounod had heard in his time at the Sistine Chapel in Rome. For its 14th Choral Pilgrimage The Sixteen and Harry Christophers revisit the golden age of Renaissance polyphony with a stunning programme of music by English composers John Sheppard, Richard Davy and William Mundy. For this year's tour, I have returned to our grass roots to focus on the music of three exceptional Tudor composers. I am delighted to revisit a work we last performed at our first-ever concert and I recall the amazing review we had for it - "not only was the sound of the choir a revelation but so too was the music". The critic was referring to William Mundy's monumental work Vox patris caelestis, the text of which comes from the Song of Songs. It is full of pictorial imagery with such phrases as "Arise, my dove, my fair one" and "the voice of the turtle dove" to revel in. Mundy is very much the youngest of our composers; he died in 1591 whilst John Sheppard only just managed to see in Queen Elizabeth I by a month or so. His setting of the "Inviolata" prose, Gaude, gaude, gaude Maria is simply glorious and is only bettered by one of the gems of Tudor music, Libera nos. I cannot think of a more sublime piece. However the most extraordinary music of all comes from the earliest of our trio, Richard Davy. He died in 1507 and the fact that his music survived the reformation is nothing short of a miracle. His remarkable work O Domine caeli terraeque was, according to the Eton Copyist, written in just one day at Magdalen College, Oxford. Each one of these works is a real gem just waiting to be discovered by a wider audience. This music is part of our great heritage and I look forward to you joining us on this pilgrimage of discovery. Charnwood Orchestra continues its year of 40th Anniversary celebrations with a wonderful concert of Russian music. Liadov was born into a family of eminent Russian musicians in 1855. As a young composer he gained an unfortunate reputation as unreliable and indolent but never-the-less was well respected for his skilful use of instrumental colours. Many of his compositions, including Kikimora and Baba-Yaga , are short tone poems and dances based on Russian folk tales. Kikimora is a malign house spirit. Liadov wrote she "grows up with a magician in the mountains. From dawn to sunset the magician�s cat regales Kikimora with fantastic tales of ancient times and faraway places, as Kikimora rocks in a cradle made of crystal. It takes her seven years to reach maturity, by which time her head is no larger than a thimble and her body no wider than a strand of straw. Kikimora spins flax from dusk and to dawn, with evil intentions for the world". Baba-Yaga is another witch figure of Eastern European / Slavic folklore. The Violin Concerto in D major, written by Tchaikovsky in 1878 is one of the best known of all violin concertos and is also also considered to be among the most technically difficult works for the violin. It was written while Tchaikovsky was recovering from depression and even once completed, it was surrounded by stormy emotional reactions, delays, cancellations and finally a damning review from an influential critic. It was several years before it became popular with the public and a regular part of the repertoire. Our soloist, Fenella Humphreys is much in demand as a soloist and chamber musician. This is hardly surprising given press comments about her playing as 'alluring', 'unforgettable' and 'a wonder'. Charnwood Orchestra is really looking forward to working with her. The Symphonic Dances is an orchestral suite in three movements. Completed in 1940 in his villa in Switzerland, it is Rachmaninov's last composition, characterised by its curious shifting harmonies, rhythmic vitality and fantastic instrumental tone colors throughout (highlighted by his use of an alto saxophone in the opening dance). The Dances allowed him to indulge in a nostalgia for the pre-revolutionary Russia he had fled in 1917. 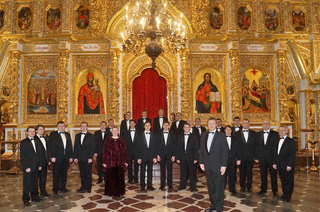 Both the first and third movements include motifs characteristic of Russian church music. He may have included material intended for a ballet entitled The Scythians, begun in 1914-15 but abandoned before he left Russia. While no manuscript for the ballet is known to have survived, this does not make his quoting the work inconceivable, given the vastness of Rachmaninov's memory. He could remember and play back accurately pieces he had heard years earlier, even those he had heard only once. The composition includes several quotations from his other works, and can be regarded as a summing-up of his entire career as a composer. 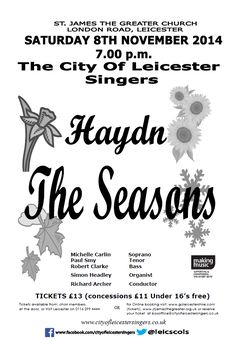 For their Autumn 2014 concert, The City of Leicester Singers have chosen the oratorio "The Seasons" by Franz Joseph Haydn. After the success of "The Creation", which had gained widespread popularity, Haydn was persuaded by his librettist to write another oratorio, based on an adaptation of James Thomson's pastoral epic poem "The Seasons", published in 1730. It is one of Haydn's last major works, and depicts the yearly cycle of countryside life as seen through the eyes of three peasants. Haydn's oratorio was first performed in Vienna in 1801 to rapturous applause. It consists of four cantatas, one for each season, and celebrates an idyllic, divinely ordered world, including even a stag hunt and a wine harvest. It has been described as a joyous evocation of the world in which the composer, son of a master wheelwright, had grown up, and concludes with a magnificent fugue celebrating the certainty of salvation. The work requires three vocal soloists, and COLS will be joined by Michelle Carlin (soprano), Paul Smy (tenor) and Robert Clarke (bass). Organ accompaniment will be provided by Simon Headley. 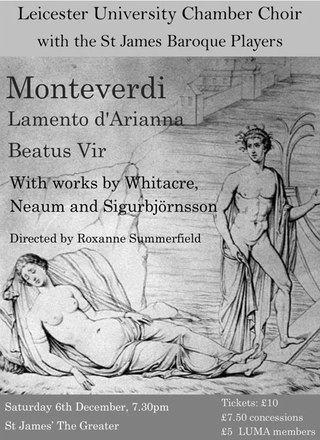 Lamento is the only surviving section of Monteverdi's opera L'Arianna, one of the earliest operas in musical history, and highly influential on the development of the operatic genre. Beatus Vir is an established choral favourite and will feature strings and chamber organ. The concert will also include modern choral works by Whitacre, Neaum and Sigurbjörnsson. 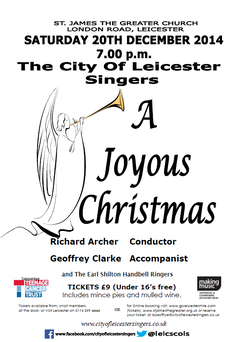 Christmas is a joyous and wonderful time, and this year The City of Leicester Singers present a selection of Christmas carols and songs emphasising the idea of joy at Christmas. 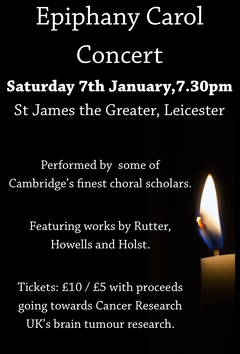 The concert includes: Stephen Cleobury's arrangement of The Joys Seven; Joy to the World arranged by John Rutter; David Willcock's Tomorrow will be my Dancing Day; and Their Sound is Gone Out from Handel's Messiah. We will also be singing an arrangement of O Holy Night, linking back to our joint concert with VISTA last year when Denise Leigh sang this beautiful piece as a solo; and the Russian Bell Carol, which is a favourite of many of our choir and we hope of you too. As usual, you the audience are invited to join us in well-known settings of several much loved carols including: O Come all ye Faithful, The First Nowell and As With Gladness Men of Old. 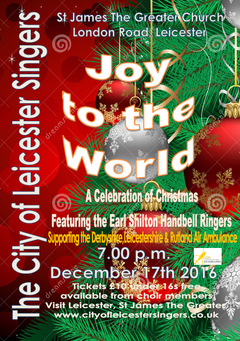 The Earl Shilton Handbell Ringers will add to the joy and magic of the evening by performing arrangements of familiar Christmas carols, some we can all hum along to. Refreshments of Mulled wine, fruit juice and mince pies will complete the evening, as we wish you all a very Merry Christmas. 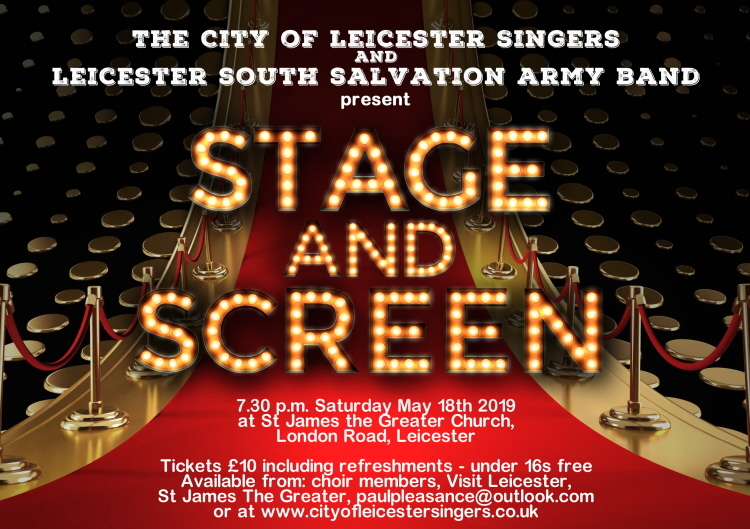 The choir is supporting Teenage Cancer Trust at the Leicester Royal Infirmary as our chosen charity this year and their representatives will welcome donations at the concert. 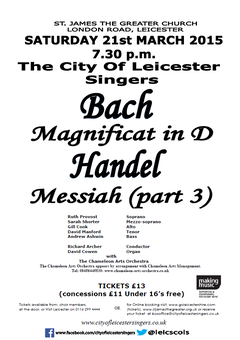 For their Spring 2015 concert, The City of Leicester Singers have chosen works by two great composers of the Baroque period, both born in 1685, namely Johann Sebastian Bach and George Frideric Handel. 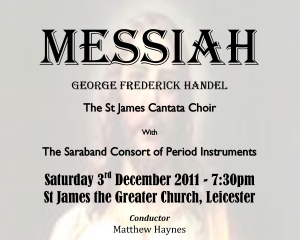 The two main works to be performed are Bach's Magnificat in D major, and Handel's Messiah Part 3. 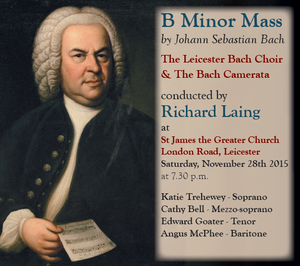 The Magnificat was composed by Bach for the Christmas celebrations of 1723, following his move to Leipzig, and is one of his most famous sacred works. The Messiah was composed by Handel in a mere 25 day period in 1742, and was first performed in Dublin. It was one of the greatest triumphs of his long musical career. Complementing these two major works are Handel's anthem Zadok the Priest, written for the anointing ceremony of the coronation of King George II in 1727; and Bach's Jesu, joy of man's desiring, which is the last movement of Cantata 147, written in 1716 and augmented in 1723. Orchestral accompaniment will be provided by Chameleon Arts Management. The organist will be David Cowen and the conductor Richard Archer. The Chameleon Arts Orchestra appears by arrangement with Chameleon Arts Management. 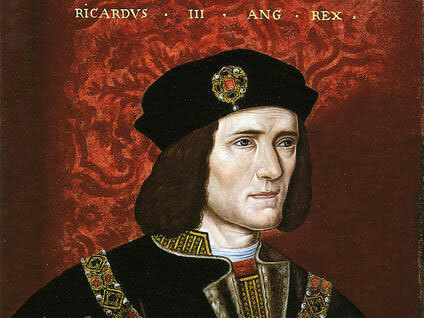 On reinterment day, join members of the Richard III society, and invited guests for a very special performance of the Middleham Requiem which celebrates the life of Richard III. With a 21-piece orchestra, a choir of 50, 12 choristers, three soloists and a narrator, this will be only the fourth, but the most poignant, performance of this unique work which premiered at Fotheringhay church in 1993. The narrator will be Sir Timothy Ackroyd, the actor, writer and director. FULL NAMES, ADDRESS AND DATE OF BIRTH OF EACH PERSON ATTENDING MUST BE GIVEN AT TIME OF BOOKING. YOU MUST ARRIVE BY 6PM FOR THE CONCERT TO PASS THROUGH SECURITY CHECKS. PHOTO ID MUST BE BROUGHT. Hosted by the Lord Lieutenant of Leicestershire, Lady Gretton and the Richard III Society in partnership with St James the Greater. Ticket price includes an interval drink. 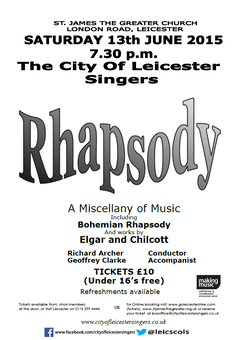 Entitled 'Rhapsody', our programme will be an eclectic mix of works by composers from Elgar to Freddy Mercury. Elgar's From the Bavarian Highlands contains some of his most felicitous choral writing, including wonderful tunes. Bob Chilcott is a leading composer of contemporary choral music - always inspired and immaculately crafted. Freddie Mercury's Bohemian Rhapsody is a mixture of many styles - a classic. We also have a piece that will be new to many - Ola Gjeilo's The Ground. The accompanist will be Geoffrey Clarke and the conductor Richard Archer. Mozart struggled to earn enough money in his final years. In 1791 he decided to apply his skills as an opera composer to a more commercial venture; he invited his friend Schikaneder to create a singspiel, a popular format that blended singing and spoken dialogue in native German (like today's Broadway musicals). Schikaneder would provide his theatrical troupe and write a libretto borrowing elements from popular fairy tales. This new comic opera, The Magic Flute, took shape during the spring and summer of 1791 and opened on September 30. Sadly, Mozart never fully capitalized on the popular success of his fanciful creation because he died a little more than two months after its premiere. Beethoven's output in nearly every musical genre was prolific - so it's perhaps surprising that he wrote only the single concerto for one of the most popular instruments of his day: the violin. This work, which is now so firmly accepted as one of the greats of the repertoire, was slow to take off. Unlike many other pieces by the great composer, it certainly didn't become an instant hit. The concerto was rattled off by Beethoven in a remarkably short space of time. He took just a few weeks to compose it in the winter of 1806, and it was premiered within days of its completion on 23 December. This was a fairly rushed affair. The soloist hadn't had time to learn his part, so spent a good deal of the concert sight-reading. It's hard to imagine Beethoven being too pleased with such an approach. We are delighted to welcome Tom Bowes back to Charnwood Orchestra from his Bach Pilgrimage. "I shall never write a symphony! You can't have any idea what it's like to hear such a giant marching behind you!" Brahms was 39 and a well-established composer when he wrote these words. He saw the symphony as the musical form in which a composer had to prove himself but was haunted by the shadow of Beethoven. He eventually produced his 1st Symphony but even when he started work on the 4th, he was reluctant to admit what he was really working on. Shortly before completing it he commented "perhaps it will not get much of an audience." Friends and critics were, at first, not sure what to make of the symphony - some at first found it "very difficult" and one critic described the first movement as "like being beaten up by two tremendously intelligent people". Brahms conducted the symphony's first performance in 1885. Like its predecessors, it was an immediate success. He was worrying for nothing! 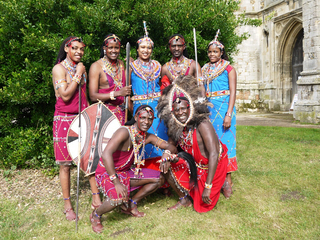 The Osiligi Maasai Warrior Troupe make their first visit to Leicester, although this is their thirteenth year of touring the UK. The proceeds of the tours, and the charity that stemmed from it, have seen their community, some 30 miles South of Nairobi, rise out of total destitution, to a point where they have a new school, a new church, a clinic, fresh clean water and solar lighting. The troupe are stunning performers, and always receive a rapturous reception. Their concert is a sensation to watch, much more than a performance. It's an unforgettable, once in a lifetime experience! They thrill all audiences aged 5-95. Everyone is enthralled and excited by their song and natural rhythm, and their jumping, for which they are renowned, is really something to behold! All performances are narrated. ELIJAH was written in two parts for the Birmingham Music Festival of 1846 and depicts events from the life of the Prophet, including the raising of the widow's son, the victory over the prophets of Baal and the ending of the drought in Israel. Containing rousing choruses, and an extended operatic like duet between the widow and Elijah, the work ends with the triumphal chorus "Thanks be to God". 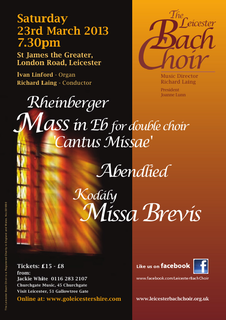 The first part of the Concert will be a performance of the Mass Number 2 in G by Schubert, a highlight of which is the memorable setting of the Benedictus sung by the Soprano, Tenor and Bass soloists. The soloists will be Michelle Carlin (Soprano), Alison York (Alto), John Gull (Tenor), Michael Dewis (Bass) and a Chorister from St. James The Greater Church will sing Treble. The accompanist will be Simon Headley and the conductor Richard Archer. 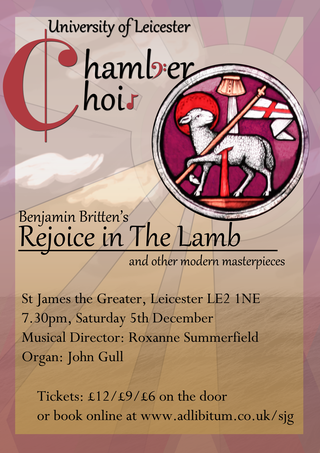 Leicester University Chamber Choir presents Benjamin Britten's Rejoice in the Lamb, a cantata for soloists, chorus and organ, is a wonderfully eccentric depiction of worship in all its many and varied forms. 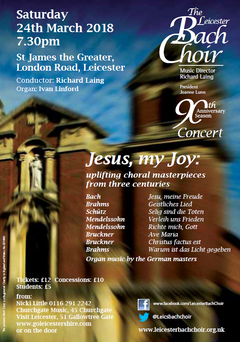 The concert will also feature a selection of other great choral works of the 20th and 21st centuries. Come and enjoy an exciting musical evening with this young, vibrant choir. 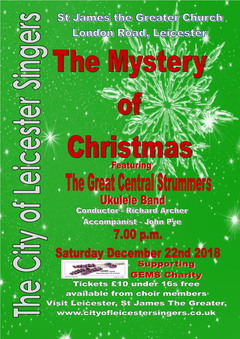 Christmas is a joyous and wonderful time and this year The City of Leicester Singers present a wide-ranging selection of favourite and traditional Christmas carols and songs. 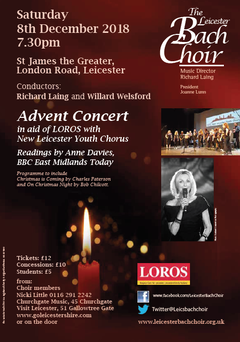 In addition we will be singing Carl Schalk's lovely "Before the Marvel of this Night" and two carols by Bob Chilcott. 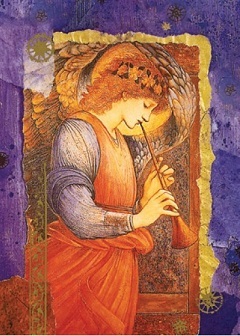 As usual the audience will be invited to join us in well-known settings of several much loved carols including Once in Royal David's City, Hark the Herald Angels Sing and It Came Upon a Midnight Clear. This year, for the first time, we are very pleased to welcome the accordionist David Price to our concert. David is well-known on the local scene and promises us an evening of lively and festive music. The choir is supporting Save the Children as our chosen charity this year. There will be a retiring collection after the concert. 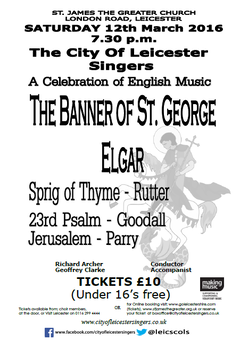 Elgar's The Banner of Saint George, celebrates the story of England's patron saint, as he rescues the maidens of Silene from a dragon, using his mighty sword Ascalon. Set to the words of the poem by Shapcott Wensley, the work was commissioned by Novello in 1896, and composed in only one month. As a devout Roman Catholic and of lower middle class origins, Elgar might not have been seen as part of the 'establishment', but he regarded himself as above all, a proud Briton, and keen to serve his country. This little known work relates a well known story with music which is dramatic, colourful and full of memorable tunes. Set in 1916 to William Blake's 1808 poem 'And did those Feet', Parry's 'Jerusalem' needs no introduction. Its wistful longing for a 'green and pleasant land' is reflected in Goodall's melodious setting of the 23 Psalm. Both are popular pieces with lives beyond choirs. Jerusalem is the official hymn of England and Wales Cricket Board and beloved of Rugby League and the WI. Goodall's setting of the 23rd Psalm, made popular by BBC's 'The Vicar of Dibley', can be found in the repertoire of choirs across the country. Lastly, in 'A Sprig of Thyme', John Rutter has arranged a collection of well-known folksongs, breathing new life into them while retaining their integrity. 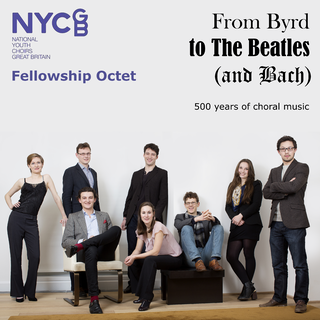 The eight young singers who make up the 2015-16 Fellowship Octet are a remarkable group of multi-talented musicians with vocal talent to burn - prepare to be impressed! Their wide-ranging repertoire emcompasses choral music from Byrd to The Beatles and everything in between. 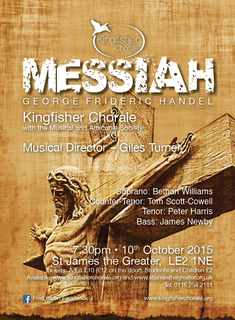 This concert will showcase the talents of some of Great Britain's finest young singers. Launched in 2015, the NYCGB Fellowship Programme is a major new initiative by the National Youth Choirs of Great Britain which aims to create the most highly skilled and multi-talented choral singers in the UK. Each year, eight singers aged 22-25 selected at open audition benefit from a comprehensive and remunerated 50-day professional training programme designed to develop outstanding skills in performance, education and leadership. Fellowship holders are supported by individual bursary awards of £4,000 plus expenses, with the possibility of additional fees for engagements throughout the year. 2015-16 Programme highlights include performances at the Royal Albert Hall; Aldeburgh Christmas Festival; King's College, Cambridge; St James the Greater, Leicester; Royal Concert Hall, Nottingham; Cheltenham Festival; tours to Malta and China; masterclasses and mentoring from Harry Christophers, James Gilchrist, Kitty Whately and Roland Wood, workshop leading at the Royal Welsh College of Music & Drama; Royal Hospital School, Suffolk and Cornwall Music Education Hub and a diverse range of professional guidance sessions. The NYCGB Fellowship Programme is principally supported by ABRSM and Dunard Fund, with additional support from the Royal Albert Hall, the D'Oyly Carte Foundation, NM Rothschild & Sons, the Ofenheim Trust, the Stanley Picker Trust, the Garrick Charitable Trust and the Fidelio Trust. "The NYCGB Fellowship Programme is vital in enabling the most talented and motivated young singers to fulfil their potential and develop into artists capable of entering the music profession at the highest level." - Nicholas Sears, Head of Vocal Studies, Royal College of Music. We are delighted to able to welcome them to Leicester - even more so as they include a former Head Chorister of St James the Greater. There will be a cash bar open from 6.30pm. 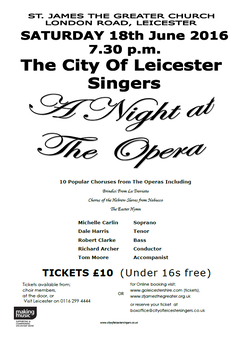 If like a lot of people you don't fancy the thought of sitting through a complete opera but really enjoy hearing the well known tunes from them, the next City of Leicester Singers concert is for you. 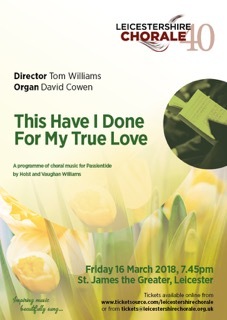 Everyone is bound to hear several of their favourites in the varied programme with Choir items ranging from the haunting "Chorus of the Hebrew Slaves" to the rousing "Triumph Scene from Aida" and favourite solos from Michelle Carlin, Dale Harris and Robert Clarke the Soprano, Tenor and Bass soloists. The accompanist is Tom Moore and the concert will be conducted by Richard Archer. 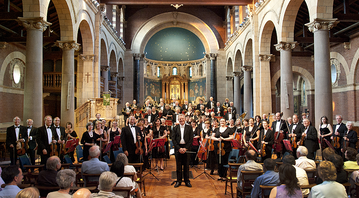 Charnwood Orchestra's season ends in spectacular style with an exciting concert of twentieth century English music. In 1909, Vaughan Williams was asked to write the incidental music for a production of Aristophanes' play The Wasps. VW obliged with an overture and 17 other items. The music was a huge hit. Although the play is strongly satirical, the music is consistently jolly and good-natured, reflecting the sound and spirit of English folk songs (even though there are no actual folk songs, nor Greek music, nor Greek scales; only a very waspish buzzing.) The overture quickly entered the concert repertoire as a stand-alone piece. Fantasia on Greensleeves by Vaughan Williams is an exquisite four-minute orchestral miniature that has far eclipsed the song it was inspired by, Greensleeves, a traditional melody that was doing the rounds in the days of the Tudors. Originally it was used in the third act of the composer's Shakespeare-inspired opera Sir John in Love but has become a popular piece on its own. VW manages to capture the very essence of England, the serene, pastoral sounds evoking images of bucolic bliss. While some view the Tuba Concerto by Vaughan Williams as the eccentric idea of an aging composer, it soon became one of his most popular works, and an essential part of the tuba repertoire. VW wanted to give the tuba a rare chance to take centre stage and went to considerable efforts to study its capabilities. True, its elephantine humour is exploited in the first movement, but its unsuspected agility is given rein too; the slow movement has a main theme of lyrical beauty and in the Finale, the tuba romps amid the dancing strings, like Falstaff among the fairies in Windsor Forest. 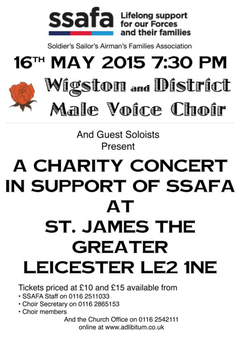 Our soloist, Stephen Calow is the young Leicestershire musician. He is no stranger to the orchestra but his first time performing with us a soloist. The Planets Suite by Holst must be one of the most famous and popular pieces of English music in the world (excluding pop music!) It was also Holst's largest orchestral work, consisting of "seven influences of destiny and constituents of our spirit". It originated from his study of astrology which had helped him come to terms with a period of musical disappointments. Holst began to write Mars just before the outbreak of war in 1914 followed by Venus and Jupiter, then Saturn, Uranus and Neptune and finally Mercury in 1916. He then arranged them in the playing order Mars, Venus, Mercury, Jupiter, Saturn, Uranus and Neptune, not the astronomical order. He explained the astrological pattern as symbolising the unfolding experiences of life from youth to old age (although others dispute this meaning). Surprisingly, Holst was most dismayed by the international popularity of the suite. 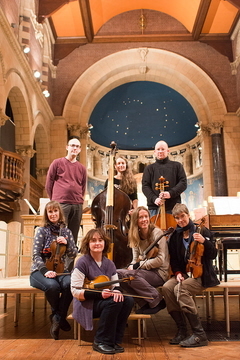 The Gesualdo Six are a vocal sextet specialising in the performance of renaissance polyphony, directed by Owain Park. 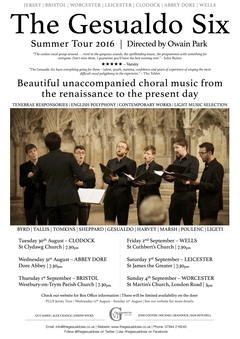 Formed in March 2014 for a performance of Gesualdo's Tenebrae Responsories for Maundy Thursday, the ensemble has since gone on to perform numerous concerts around the UK, including a ten-concert tour in the summer of 2015. Whilst focusing on early music, the group often programmes modern works, recently juxtaposing madrigals by Monteverdi and Gesualdo with Ligeti's Nonsense Madrigals. Other programmes have included sacred and secular renaissance works by the English and Italian masters, combined with modern works by Poulenc, Jackson and Lukaszewski. In June 2015, the group were revealed as St John's Smith Square Young Artists, following a highly competitive audition process. The scheme aims to invest in future talent, selecting promising artists who show "enormous talent and energy", endeavouring to help shape their futures. The ensemble will perform several times at St John's Smith Square during the 2015/16 season. Concert pianist Eleanor Hodgkinson in a varied programme including pieces by Debussy, Chopin and Albeniz - as well as some intergalactic hits such as Star Wars! 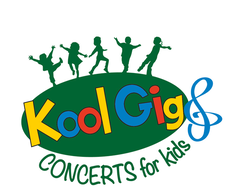 Following a successful pilot concert in April 2016, KoolGigs are returning to present a new series of interactive family concerts at St James the Greater, running from October to March. An off-shoot of the popular BabyGigs series, these concerts are aimed at the whole family and also feature young, local performers; however the emphasis is still on a relaxed atmosphere that focuses on children. Founder Eleanor Hodgkinson is keen to bring classical music to everyone, in an enjoyable way as possible. The concerts are given by some of the UK's leading professional musicians, all highly experienced in performing to a wide age range: expect audience participation, games, dancing and much more... or just come along and listen! Each concert starts at 3pm and lasts no longer than 1 hour. There is comfy floor seating in addition to chairs, and all ages are welcome. Refreshments are kindly provided by the church, with donations to the choir's fund. 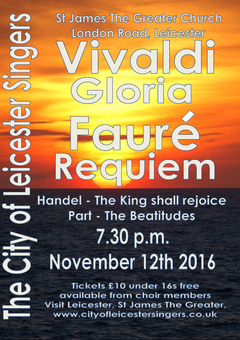 For their Autumn 2016 concert, The City of Leicester Singers have chosen popular contrasting works by Vivaldi and Fauré. 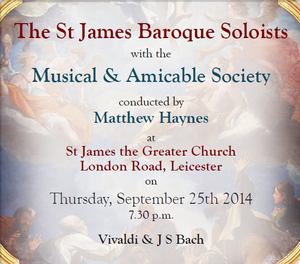 The two main works to be performed are Vivaldi;s Gloria and Fauré's Requiem. The Gloria in D Major is Vivaldi's best-known sacred composition and was written around 1713 during his employment at the Ospedale della Pietà, one of four Venetian orphanages for girls. 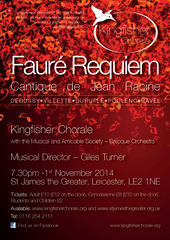 The Requiem was written in 1888 shortly after the death of Fauré's own mother. It is a tender rather than grief-stricken work, and offers what Fauré called "an aspiration to the bliss of the beyond". Complementing these two major works are Handel's anthem "The King shall rejoice", written for the actual crowning of King George II in 1727, and one of the four coronation anthems; and "The Beatitudes", written in 1990 by the contemporary Estonian composer Arvo Pärt. The military sounds of the saxophone will be heard as John Barker, Assistant Head of Music at Leicester Grammar School, treats us to some well-known classics along with performances from two of his advanced students. A special concert to celebrate the ministry of our Vicar, Canon Glynn Richerby, with favourite music from throughout the Church's Year. The concert features our current choir, former members and friends singing resounding hymns of praise, festive favourites and classic Anglican masterpieces. There is no set entry charge however there will be a retiring collection to cover the costs of the concert and support music at St James. Prior to the concert, there will be an organ recital from 6.00pm to 7.00pm featuring romantic French masterpieces including Vierne's wonderfully crafted 3rd Symphony. Music by Vierne, Alain, Mulet and Howells. Doors, refreshments and cash bar will open at 5.30pm. 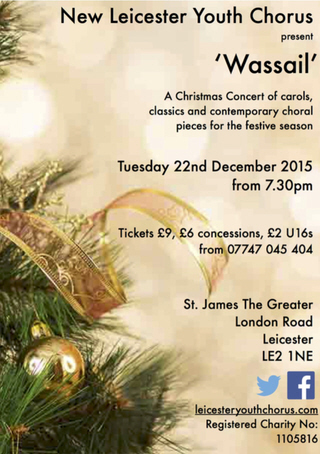 Featuring Emma Trounson (soprano) alongside the Choir of St James the Greater, in a programme of seasonal favourites. 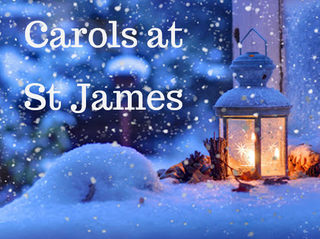 Aimed at the heart of Christmas, these atmospheric concerts have become a popular tradition in Birmingham and London, which this year we extend to the fabulous acoustic of St James the Greater, Leicester. A seamless stream of music brings old favourites, stunning new music and hidden gems, all interspersed with readings that capture the meaning - and humour - of the season. 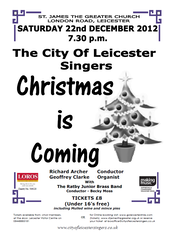 This year the City of Leicester singers has chosen "Joy to the World" as their theme for their Christmas concert. We travel round the world to far off lands from Australia's "The Christmas Tree", through the Ukraine with "Carol of the Bells" and to America for the Spiritual "Rise up Shepherd". Our central item is "Fantasia on carols" by Vaughan Williams which focusses on English carols. As part of our concert we are delighted to welcome back the Earl Shilton Handbell Ringers, who will entertain us during our concert. We have also invited the Leicestershire and Rutland Air ambulance to attend and advertise their cause, whilst taking a retiring collection. 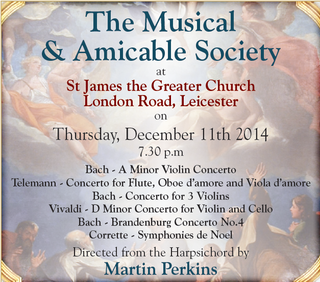 Join us for an evening of Epiphany Carols in the beautiful acoustics of St James the Greater, Leicester. Featuring music by Rutter, Howells and Holst, performed by some of Cambridge's finest choral scholars from the world famous Trinity, Sidney Sussex and Caius College Choirs, this concert is not to be missed. 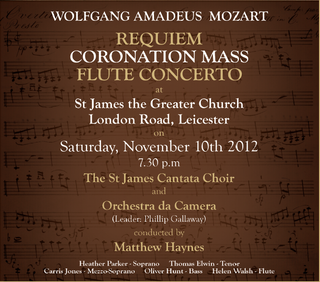 Proceeds from this concert will go towards Cancer Research UK's Brain Tumour Research. Cellist Nick Stringfellow performing "The Story of the 'Cello", with members of the Leicester Suzuki Group. 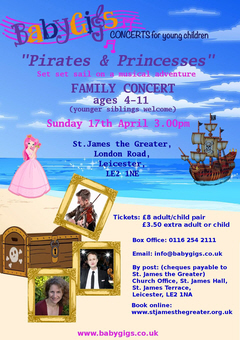 "Pirates and Princesses" returns on 19th March, with more musical mayhem from our pirates - and will also feature local young soloists. 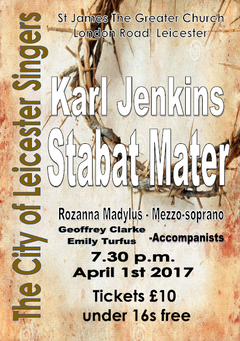 For their Spring 2017 concert, the City of Leicester Singers have chosen as their principal work a 2008 setting of the 13th century religious text Stabat Mater by the contemporary Welsh composer, Karl Jenkins, who was born in 1944. The text focuses on the suffering of Mary, mother of Jesus Christ, during his crucifixion. Karl Jenkins also includes texts which lie outside the original Stabat Mater, and which are sung in a variety of languages: English, Hebrew, Latin, Aramaic, Greek and Arabic. Contralto soloist for the Stabat Mater will be Rozanna Madylus. 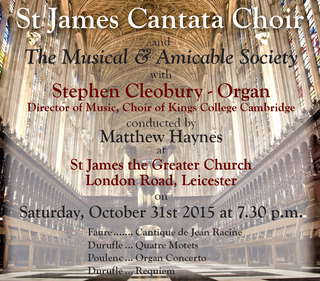 Organ and piano accompaniment will be provided by Geoffrey Clarke and Emily Turfus. 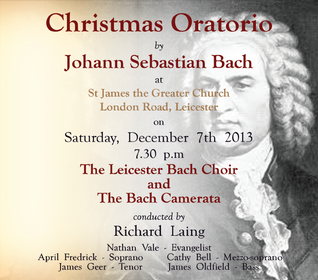 The concert will be conducted by Richard Archer. 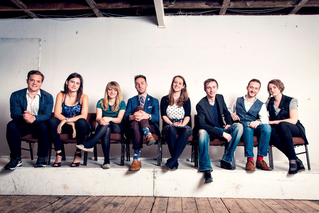 NYCGB Fellowship Programme octet 2016-17. Monteverdi, Ramsey, Gombert, Purcell, Leighton, Vaughan Williams, Britten, Park, Hamilton, Swingle, Trad American, Trad Hawaiian, Goffin, Joel (arr Lawson), Webster/Harris (arr Friedman). Sadly, owing to very low ticket sales, this concert will no longer take place. The NYCGB Fellowship Programme is vital in enabling the most talented and motivated young singers to fulfil their potential and develop into artists capable of entering the music profession at the highest level. Nicholas Sears, Head of Vocal Studies, Royal College of Music. Launched in 2015 by the National Youth Choirs of Great Britain, the NYCGB Fellowship Programme is a major new initiative which aims to create the most highly skilled and multi-talented choral singers in the UK. Each year, eight singers aged 22-25 selected at open audition benefit from a unique 50-day professional training programme designed to develop outstanding skills in performance, education and leadership. Fellowship holders are supported by generous individual bursary awards. Highlights of the 2015-16 Fellowship Programme included performances at the Royal Albert Hall, the Aldeburgh Easter and Christmas Festivals, Cheltenham Festival, King's College, Cambridge, Royal Concert Hall Nottingham, tours to Malta and China, masterclasses and mentoring from Harry Christophers, James Gilchrist, Kitty Whately and Roland Wood, leading workshops at the Royal Northern College of Music, Royal Welsh College of Music & Drama, and Cornwall Music Education Hub, broadcasts and recordings for the BBC and NYCGB's own digital record label, and professional seminars on audition technique, stagecraft, self-employed finances and marketing. 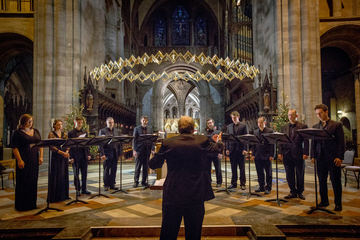 The 2016-17 Fellowship Programme features a range of new opportunities including education work with children in Nottinghamshire and County Durham, a residency and concert performance of Handel's 'Messiah' at Snape Maltings, self-devised singing workshops with primary schools around the UK, recording sessions with Tenebrae vocal consort, a performance with The King's Singers, teaching and mentoring on NYCGB residential courses, and multitrack video recording experience with YouTube musician James Rose. The NYCGB Fellowship Programme is principally supported by ABRSM and Dunard Fund, with additional support from the Royal Albert Hall, the D'Oyly Carte Foundation, NM Rothschild & Sons, the Ofenheim Trust, the Stanley Picker Trust, the Garrick Charitable Trust, the Fidelio Trust, and I Fagiolini Charitable Trust. 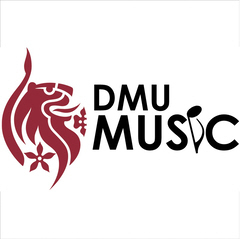 The De Montfort University Orchestra celebrates its 1st birthday with a performance of Beethoven's epic 9th Symphony featuring four incredible soloists, a chorus of over 50 singers from choirs across Leicestershire and the world premiere of 'Perhaps', commissioned by the DMU Orchestra and written by celebrated composer and Philharmonia Orchestra Cellist, Richard Birchall, for Soprano and Orchestra. 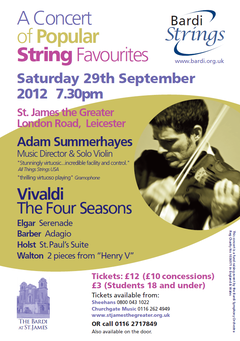 The concert will be conducted by the DMU Orchestra Musical Director, Samuel Burstin. Based in London, Samuel is an award-winning conductor and in 2014 was a prize-winner at the highly prestigious Evgeny Svetlanov International Conducting Competition in Paris, where he conducted the Orchestre Philharmonique de Radio France at the Salle Pleyel. The following year, Samuel made his Russian debut in Kazan with the Tatarstan National Symphony Orchestra, with the Korngold Violin Concerto (Laurent Korcia) and Bartok's Concerto for Orchestra. As an orchestral musician, Samuel has played principal viola with the BBC National Orchestra of Wales, BBC Philharmonic, Bournemouth Symphony, New Zealand Symphony, Opera North, Royal Liverpool Philharmonic and Scottish Chamber orchestras, joining the Viola section of the Philharmonia in 2005. 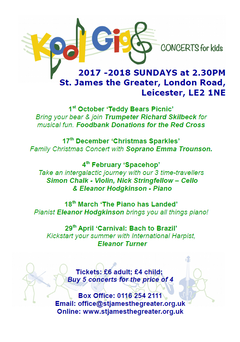 Bring your bear and join Trumpeter Richard Skilbeck for musical fun. Foodbank Donations for the Red Cross. KoolGigs are returning to present a new series of interactive family concerts at St James the Greater, running from October to April. An off-shoot of the popular BabyGigs series, these concerts are aimed at the whole family and also feature young, local performers; however the emphasis is still on a relaxed atmosphere that focuses on children. Each concert starts at 2.30pm and lasts no longer than 1 hour. There is comfy floor seating in addition to chairs, and all ages are welcome. Refreshments are kindly provided by the church, with donations to the choir's fund. 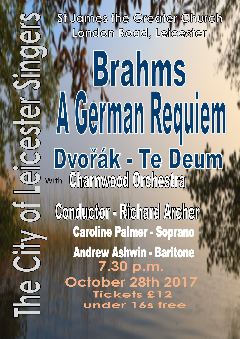 For their Autumn 2017 concert, the City of Leicester Singers have chosen works by two great composers of the 19th century Romantic period, Brahms (1833-1897) and Dvorák (1841-1904). The two works to be performed are the German Requiem by Brahms and the Te Deum (opus 103) by Dvorák. The Requiem, composed between 1865 and 1868, is Brahms's longest composition, sacred but not liturgical, and very much a requiem in the German language. The text is derived from the German Luther Bible, and the requiem was probably inspired by the death of Brahms's mother in 1865. The Te Deum was composed in 1892 during Dvorák's American period to mark the 400th anniversary of the discovery of that continent by Christopher Columbus. 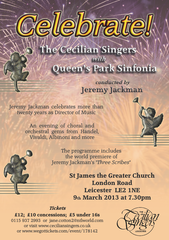 The City of Leicester Singers are delighted that they will be accompanied by the Charnwood Orchestra in this venture. 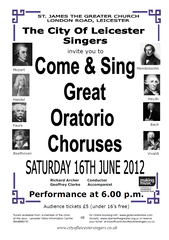 Vocal soloists will be Caroline Palmer (soprano) and Andrew Ashwin (baritone). The concert will be conducted by Richard Archer. 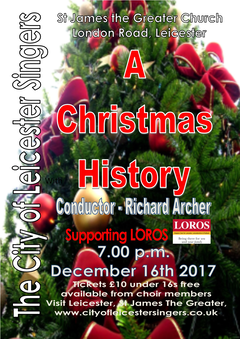 This year, The City of Leicester Singers present an evening of music and readings which will celebrate the festive season by exploring its story through the ages to modern times. We hope that our programme will provide something of interest, and even amusement, for all, as well as giving our audience the opportunity to join us in singing some favourite carols. Our carols are arranged in chronological order, starting with music from the fourteenth century, and finishing in the present day. Most will be familiar, but a few are new not only to the choir, but probably also to those listening. Readings by members of the choir - a mixture of prose and poems - will explore the development of Christmas and the origins of many customs associated with it. We hope that our concert will be enjoyable, and informative in a light-hearted way. It might even provide some interesting things for our audience to pass on to friends and family over the Christmas season! Featuring Emma Trounson (soprano) in a programme of seasonal favourites. 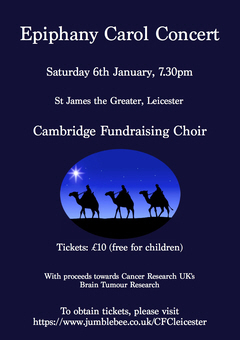 The Cambridge Fundraising Choir will perform Epiphany Carols in the beautiful church of St James the Greater - the proceeds of this concert will go towards Cancer Research UK's Brain Tumour Research. The programme will include works by Howells, Rutter and Tavener, and there will be a 20 minute interval with refreshments. 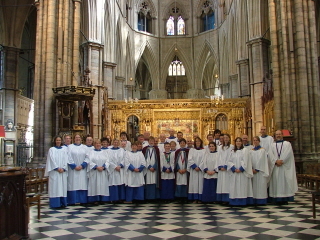 The choir is composed of current and former choral scholars at Cambridge University who study a wide range of subjects. Within their respective college choirs, they have been fortunate to be a part of professional CD recordings and tour all over the world, with trips to Australia, America, Hong Kong, Canada and Germany. They gave their first concerts in Rutland and Leicestershire in January 2017, and in the last year they have performed in Magdalen College, Oxford, St Cross, Winchester and Trinity College, Cambridge. They have raised over £6000 for Cancer Research UK's Brain Tumour Research in the last year, and they aim to raise another £2000 in January 2018. We would like to raise money to help support the invaluable work of Cancer Research UK, and in particular their contribution towards the treatment of brain tumours. We have witnessed the results of their excellent research first-hand, as in the last year two people close to members of the choir have undergone treatment for brain tumours: a 22-year-old fellow student from Trinity College, Cambridge and a godmother to a member of the group. 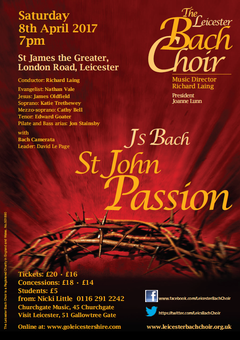 Leicestershire Chorale, one of the region's foremost chamber choirs, returns to St James the Greater with a programme of English a cappella choral music, including Ralph Vaughan Williams sublime Mass in G minor. They also include a rarely-heard setting by the same composer of the passion tide text O vos omnes and psalm settings by Gustav Holst, most famous for his Planets Suite. Pianist Eleanor Hodgkinson brings you all things piano! 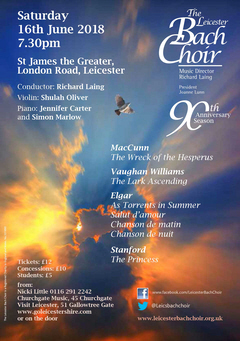 This Concert features two of the foremost choral works of the second half of the 20th century. Both are by European composers but both received their first performances in the USA. The Requiem by John Rutter was first performed in Dallas, Texas in 1985. The Gloria by Francis Poulenc was first performed in Boston Massachusetts in 1961. 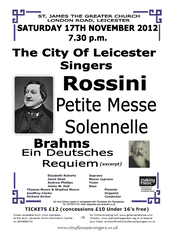 Both are written for a four part Choir and Soprano soloist and the soloist with The City of Leicester Singers will be Ruth Provost. Also included is Lamb of God a choral setting of a theme from The Pathetique Sonata by Beethoven. The organ accompaniment will be provided by David Cowens and Richard Archer will conduct. The final concert for the Charnwood Orchestra 2017/18 season sees the Orchestra performing a varied programme of works by Dvorak, Korngold and Tchaikovsky. A symphonic poem with the music following the story closely to illustrate the characters and events. A mother warns her son that if he does not behave she will summon the Noon Witch to take him away (oboe and bass clarinet are used to depict the misbehaving child and the witch respectively). Of course, the son does not behave, and the witch arrives at the stroke of noon (strokes of a bell). The mother thinks the Witch is going to take the child. The mother, terrified, grabs her son, and the witch begins chasing them. (use of different time signatures to add drama to the chase). Finally the mother grasping her child, faints. Later in the day, the father comes home to find his wife, grasping the dead body of their son in her arms. The mother has accidentally smothered the son while protecting him from the witch. The story ends with the fathers sorrow at the terrible events. The Orchestra welcomes leading violinist Fenella Humphreys in what promises to be a dazzling performance of Korngold's concerto. Fenella is in growing demand combining a busy career performing solo and chamber works. Composed in 1945, the concerto is in 3 movements, Moderato, Romanze and Allegro Vivace. Korngold draws on his film scores for themes, with an expansive scoring for the orchestra. It was premiered in 1947, by Jascha Heifet. Tchaikovksy - Symphony No.6 "Pathetique". The Symphony is in 4 movements, but needs no introduction having remained a popular choice amongst concert audiences ever since its premiere in October 1893, just nine days before the composer's death. Such is the popularity of the work that themes have found their way into popular culture in variety of ways, from films, songs, cartoons, video games and the 2010 winter Olympic closing ceremony. 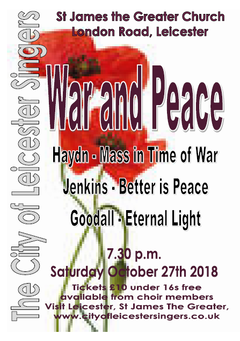 For their Autumn 2018 concert, the City of Leicester Singers have chosen to commemorate the 100th anniversary of the end of the First World War with music on the theme of "war and peace". The first work to be performed will be Haydn's Mass in Time of War (Missa in tempore belli) also known as Paukenmesse or Drum Mass. This was first performed in Vienna in 1796 at a time when Napoleon's troops were already encamped in Austria. The music in the Agnus Dei evokes the sound of the advancing French armies. The second work will be Better is Peace the final movement from The Armed Man: A Mass for Peace by Karl Jenkins, a work dedicated to the victims of Kosovo. The mass ends with the affirmation from Revelations that change is possible, that sorrow, pain and death can be overcome. The final work will be Eternal Light: A Requiem, by Howard Goodall. This was written in 2008 to commemorate the 90th anniversary of the end of the First World War, and it was Goodall's intention to acknowledge the terrible, unbearable loss and emptiness that accompanies the death of loved ones. It is thus, like that of Brahms, a requiem for the living. Vocal soloists will be Michelle Carlin (soprano), Alison York (contralto), Tom Stanyard (tenor) and Michael Dewis (bass). The concert will be accompanied on the organ by John Pye and on the piano by Emily Turfus, with additional instrumental accompaniment by Alex Rider (harp), Hari and Dipna Trivedi (percussion) and Jenny Bakewell (piccolo). The concert will be conducted by Richard Archer. Celebrating the legacy in Poetry and Song of the Lost Generation of World War I and those deeply affected. 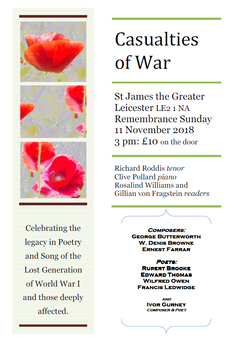 To mark the Centenary of Armistice Day, Richard Roddis (tenor) and friends present a commemorative programme of songs and readings. Rather than focussing on the conflict, this recital highlights the talent of the British composers and poets who like so many others left to fight but never returned. It also celebrates the rural landscape of England which they held so dear and which they died defending. Composers George Butterworth, the emblem of lost talent; W Denis Browne and Ernest Farrar, who both left only a handful of pieces. Poets Edward Thomas, Rupert Brooke, Wilfred Owen, Francis Ledwidge. Straddling the two art-forms and prolific in both, Ivor Gurney survived but later suffered mental breakdown. And Gerald Finzi, pupil of Farrar, champion of Gurney. 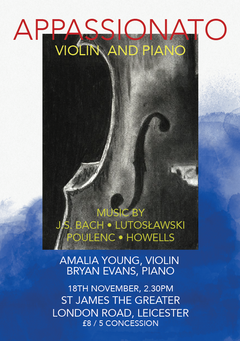 Amalia Young and Bryan Evans will present a recital of classical music for violin and piano. Amalia is a former member of the Choir of St James the Greater and is now a scholarship student at the Royal Academy of Music in London, studying with French violinist Philippe Honoré. Amalia was the 2016 Bardi Orchestra Young Musician with whom she gave an acclaimed performance of the Bruch Violin Concerto No. 1. Bryan Evans is Music Director of the London-based Diva Opera Company and has given over 3000 performances worldwide as a soloist, accompanist and conductor. The recital will include Francis Poulenc's neo-classical Violin Sonata, J.S. Bach's great G minor solo Sonata and the powerfully expressive Subito by Witold Lutoslawski. The afternoon's performance will conclude with the tempestuous Sonata No. 3 for Violin and Piano by Herbert Howells. 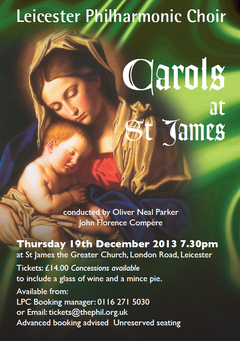 Tickets are £8 and £5 (concessions) available from the St James the Greater website and at the door. These popular concerts are aimed at the heart of Christmas. Much-loved favourites, little-known gems and stunning new works are accompanied by a selection of readings, which together capture the meaning - and humour - of the season. The Birth of Jesus, Angels appearing to Shepherds, Wise men following a star, Santa Claus and his Reindeer, Cards, Trees and Presents all combine to make Christmas time the most mysterious time of the year and all of these elements are included in The City of Leicester Singers Christmas Concert. In addition to the traditional Carols in which the audience are invited to join the choir will sing seasonal items ranging from Rudolf the red nosed Reindeer to Magnum Mysterium by Morten Lauridsen. Several members of the Choir will sing solo items and the Great Central Strummers Ukulele Band will play. 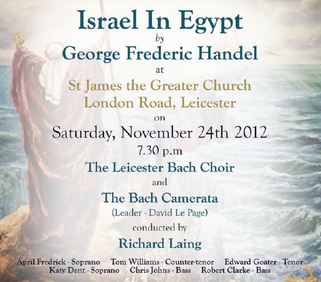 The concert will be conducted by Richard Archer. After the music Mulled Wine/Fruit Juice & Mince Pies will be served.